A zoo is a remarkable place. People can see for themselves the magnificent animals that we coexist with on the planet. 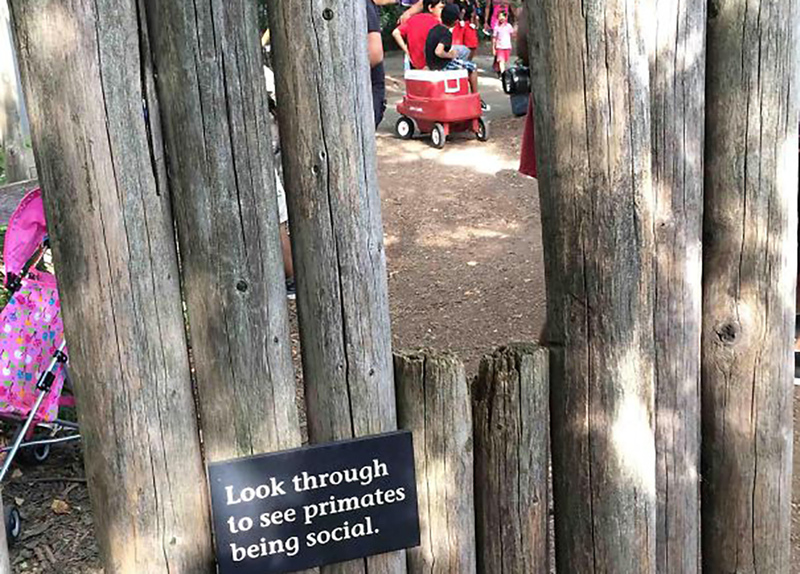 The zoo is also a place to mind your behavior. You’re surrounded by wild animals that deserve your respect and could potentially be dangerous. 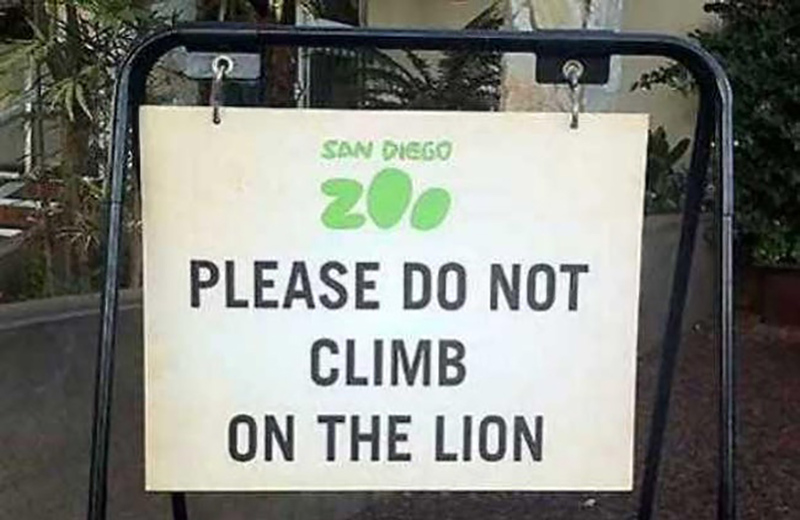 Since signs have been proven to prevent humans from acting foolishly, zoos rely on them to remind people what they should and shouldn’t be doing. 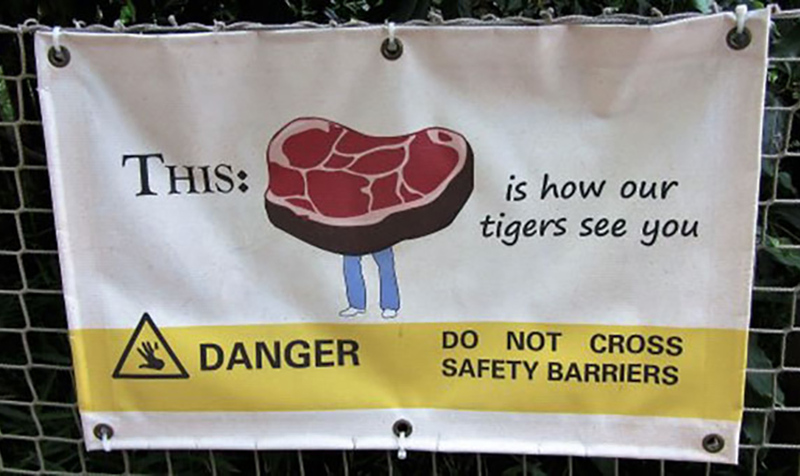 While some signs might simply tell you to keep off the grass, others can be a bit more creative. 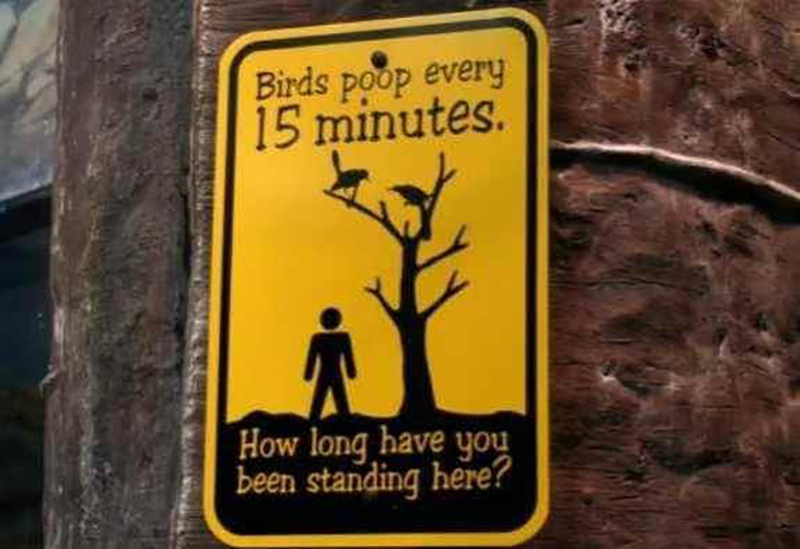 These are the funniest signs ever witnessed at the zoo. We’re not sure who would get close enough to crocodiles to throw something at them, but then again, people are wildly unpredictable. Also, what could someone possibly be throwing at a group of crocodiles, their shoes, watch, hat? It’s a little concerning that people need this sign to know not to throw things at wild animals, especially crocodiles. Hopefully, the fear of swimming with crocodiles will make them think twice about harassing these prehistoric creatures. This zoo allows smoking which is strange, but what’s even weirder is that people would litter their cigarette butts in an area surrounded by animals. So, instead of just putting up a no smoking or no littering sign, they decided to try a more comical approach. 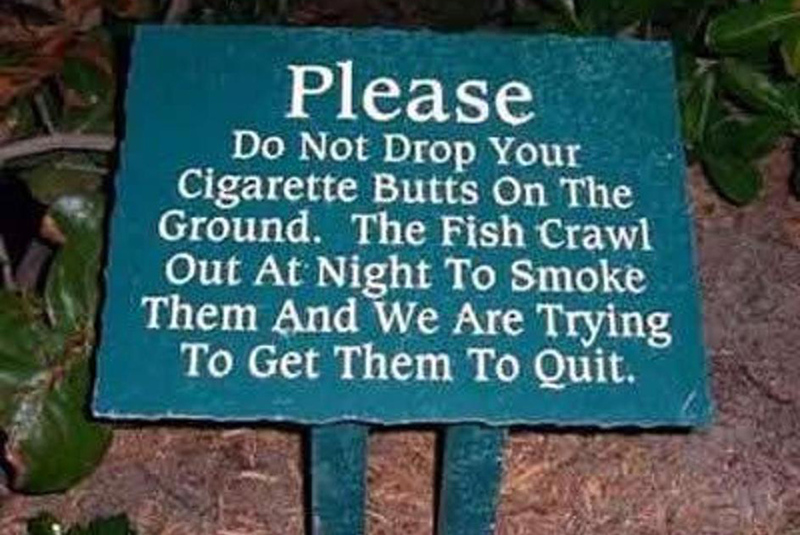 Informing people that the fish have taken up smoking because of someone else’s bad habits might get a chuckle out of people. This sign might make them less inclined to drop their butts on the ground. This sign must have saved quite a few people from finding themselves in an unfortunate situation. But then again, standing below a flock of birds is a gamble no matter what. Seeing this sign might not only keep you moving to be a harder target but also might make looking up that much more daunting. All we know is that the last thing you want to do here is stand in the same place for 15 minutes only to look up. Tapping on the glass of an animal’s cage is one of the most disrespectful and selfish things you can do at the zoo. People want to see animals move or do something, so they begin tapping on the glass in hopes of getting a reaction. People never stop to consider what it would be like if they were in a glass box with others tapping on the glass trying to get their attention. 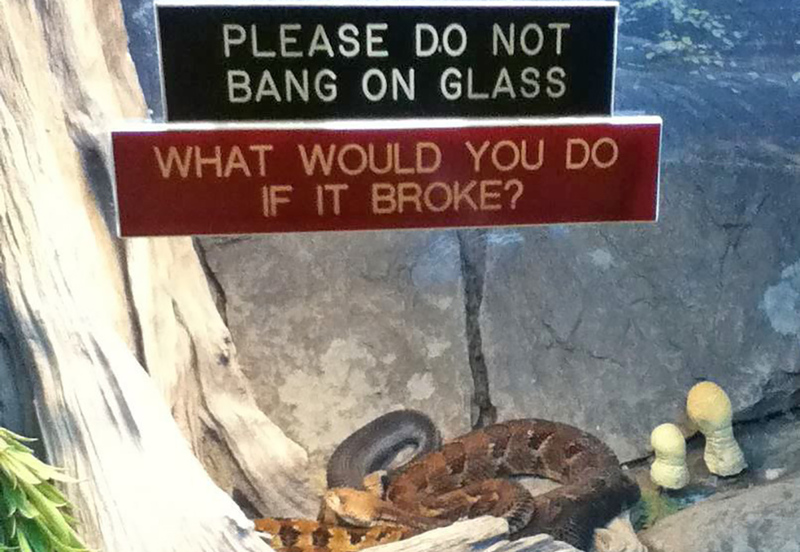 Clearly, the standard “don’t bang on glass” sign wasn’t working, so they added something to make it seem more formidable. If you’re at the zoo, you probably want to avoid climbing on any walls or gates, especially near any carnivorous animals. If you fall into the wrong enclosure, you might not be getting out. This zoo isn’t so concerned about a visitor being eaten and killed by an animal, but for the animals’ health if they were to eat a human. If you’re not afraid of losing your own life for a stupid reason, at least think about the animals. 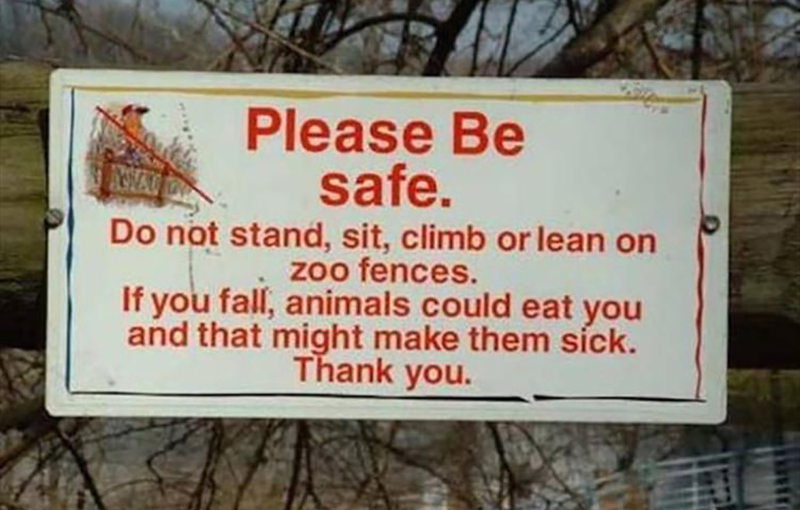 What in the world happened that a zoo needed to put this sign up? 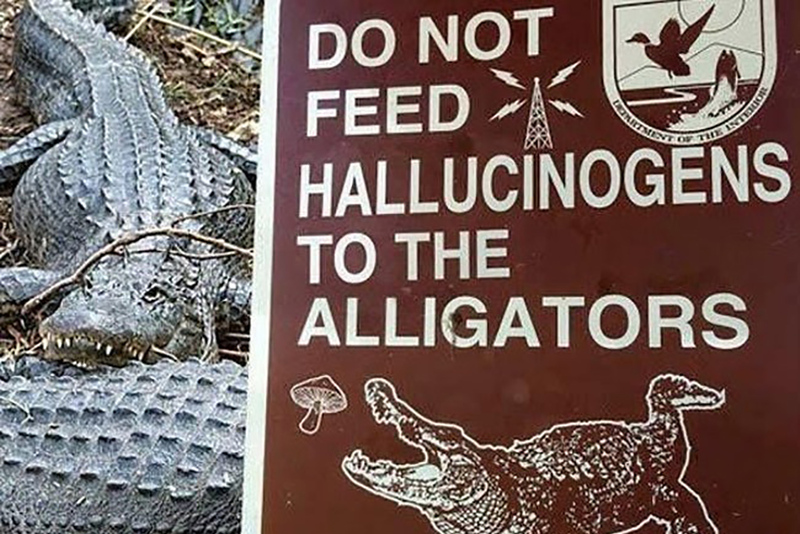 Who in their right mind would feed hallucinogenic substances to an alligator? Well, someone on hallucinogens we suppose. Not only is it hazardous to get that close to an alligator but it’s also cruel to the creatures. It’s best not to feed anything to a wild animal, especially if it is going to affect their brain chemistry. The last thing anyone needs is a rogue alligator on drugs. For some reason, people tend to forget that wild animals don’t smell like humans. Their diets and where and how they live couldn’t be more different from us. Apparently, some people were making fun of how the penguins smell at this zoo which is horrible considering how adorable and loving they are. 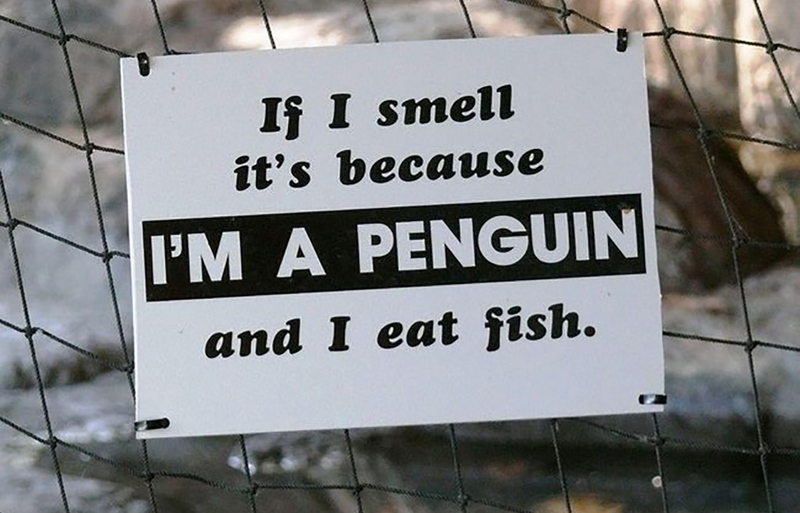 So, to remind everyone why penguins don’t smell the best, they put up this sign that explains they eat raw fish which can lead to odors. Also, they’re penguins. 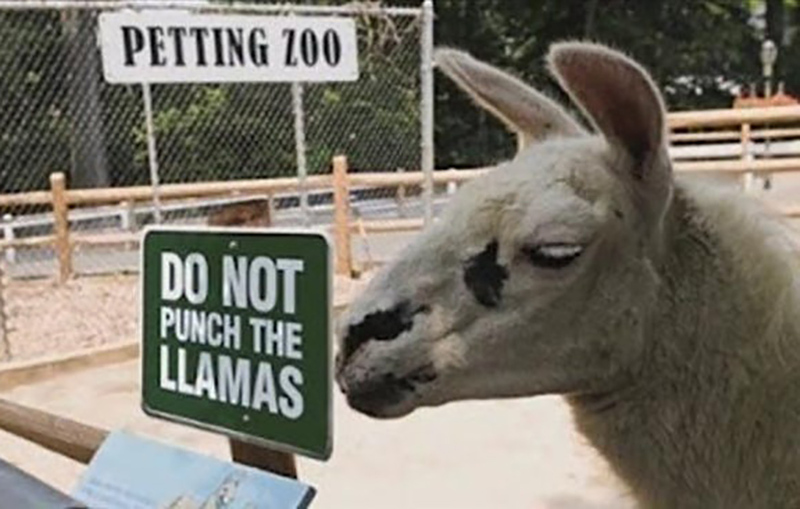 Most wouldn’t expect this sign to say “please don’t punch the llamas,” but it appears that someone once punched a llama in the past. Why someone would hit a llama is beyond us, they’re relatively docile creatures. We hope that whoever assaulted the llama was disciplined accordingly and never allowed to step foot in a zoo again. The best case scenario is that the llama spat in their face after it was punched. That’s what we call poetic justice. We get it, parents want to make their children happy. If that means getting them as close to the animals as possible, so be it. However, that doesn’t mean holding them over an enclosure where they might accidentally fall in. Most parents can understand the logic behind this, although there are undoubtedly some parents who might not. We all know what happens when a child falls into an animal enclosure, the animal usually doesn’t survive the encounter. 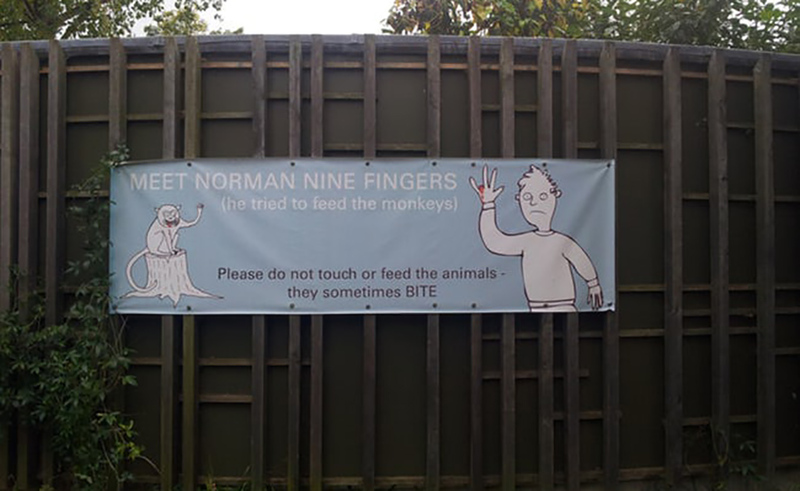 As a nice way of cautioning visitors that monkeys aren’t always the cute little pets on TV, this zoo put up a friendly reminder. You can admire monkeys from a distance, but if you try to feed them, they can get annoyed if you stop giving them food. This might lead them to bite you and you can end up like Norman. Luckily for the small children, they didn’t put up a sign of an actual hand missing a finger. 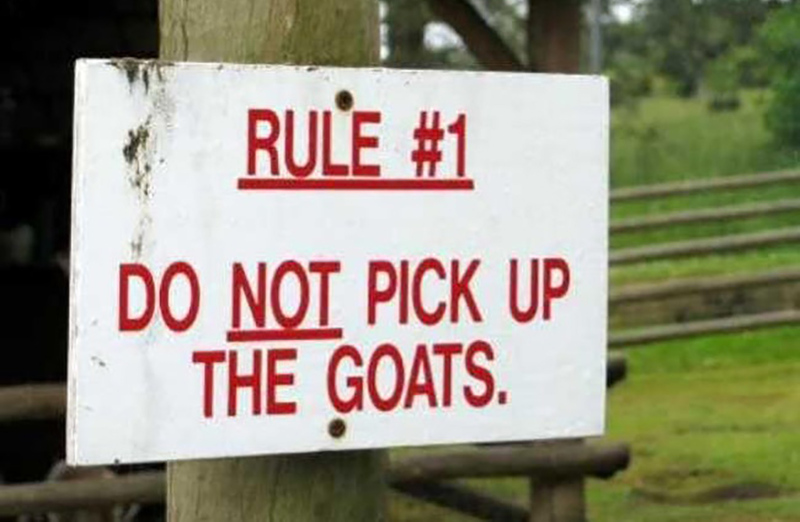 Goats are adorable animals with some impressive climbing skills, but it’s safe to say most people’s first instinct isn’t to pick them up. You can usually pet them, but they grow to be pretty large and aren’t the most sanitary animals. Besides, you probably don’t want to pick one up because a hoof to the face would be quite unpleasant. The most confusing thing about this sign, however, is that it’s rule number one. Does it really happen all that often? Gorillas are incredibly smart and resourceful animals. So, it’s probably not the best to mock them if you see them at the zoo. Not only is that degrading to them, but it also might single you out as a target. They have been known to throw clumps of “dirt” of their own making at spectators. If you see a gorilla winding up like they’re throwing a baseball, your best bet is to hit the deck and hope you aren’t the target. Who needs a guard dog when you can have a crane frighten off any intruders? Cranes are relatively large birds with a formidable beak which could do some serious damage if they wanted. 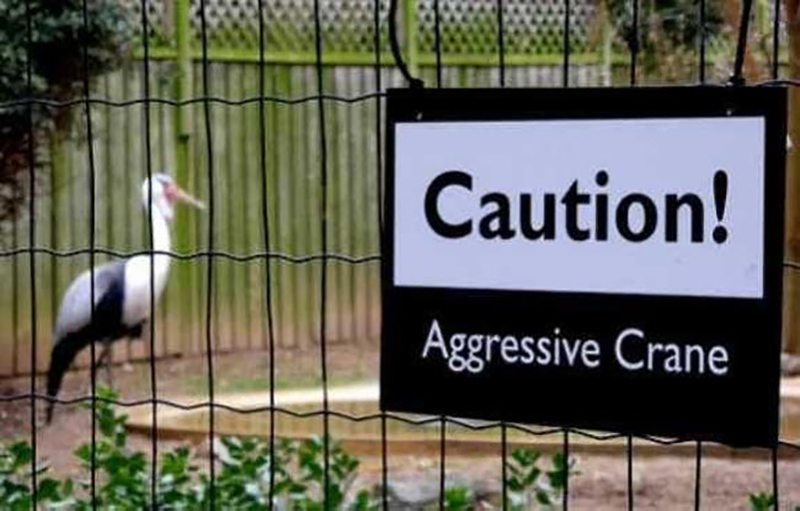 It looks like this crane has quite the attitude, so they have to warn guests that it’s not the friendliest of birds. 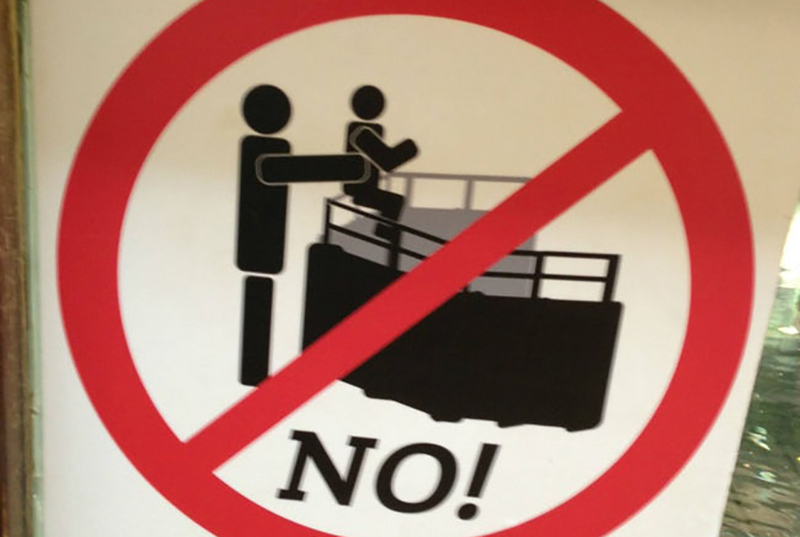 The last thing a zoo needs is some little kid getting mauled by a crane. Maybe the crane’s attitude is what got it its own enclosure. Smart bird. When it comes to lions, most people’s first instinct isn’t to climb on top of it. Riding a lion is something best left in fantasy books because, in real life, that might end horrifically. Not that lions are necessarily bloodthirsty beasts, but your best bet is to keep a safe distance from them. If they haven’t eaten in a while, you might look like a nice meal to them, and you wouldn’t be able to put up much of a fight. Just to clarify, molest is just another way to say harass, although it’s certainly an interesting word choice for this sign. 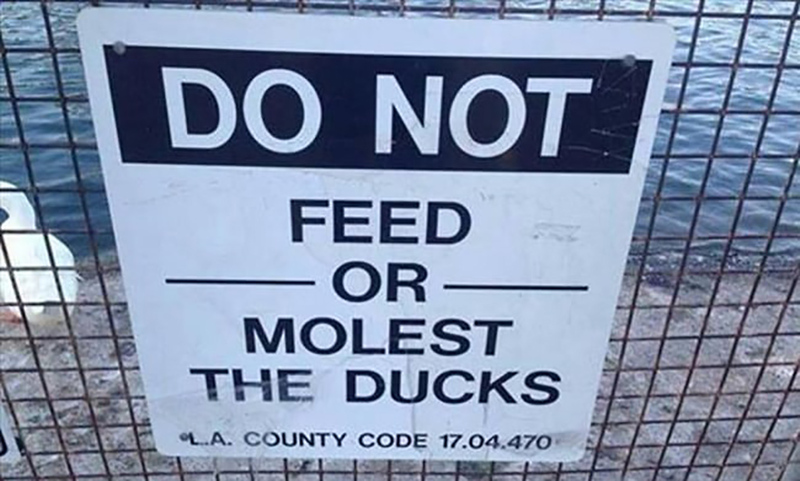 Signs that instruct people not to feed the ducks are relatively common. However, this sign might stop people right in their tracks. You know more than one person has seen this and wondered what possibly could have gone down that a sign was needed. No ducks were harmed in the writing of this post. Even though the bears get fed enough protein by their caretakers, that doesn’t mean that they would mind a little afternoon snack. 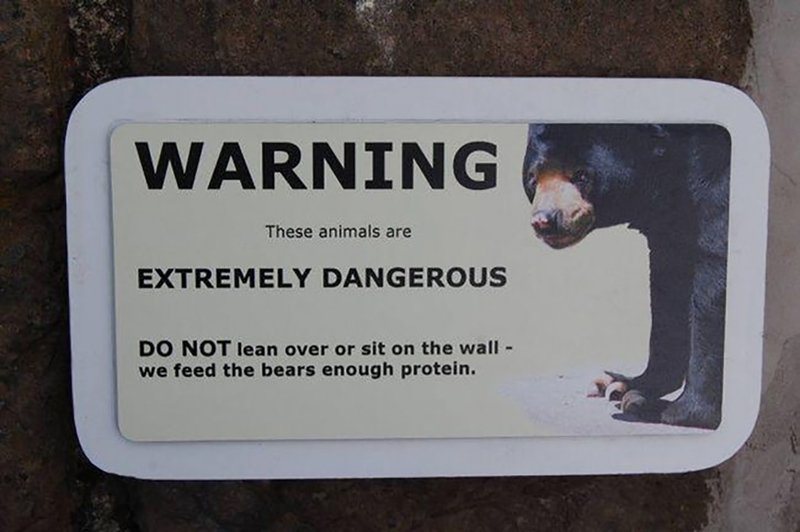 To avoid being that snack, it’s wise to abide by this sign and not lean over or sit on the wall of the bear enclosure. The sign literally says “these animals are EXTREMELY DANGEROUS,” so you might want to follow instructions. By the looks of that bear’s claws, most people probably don’t even go close to the wall. 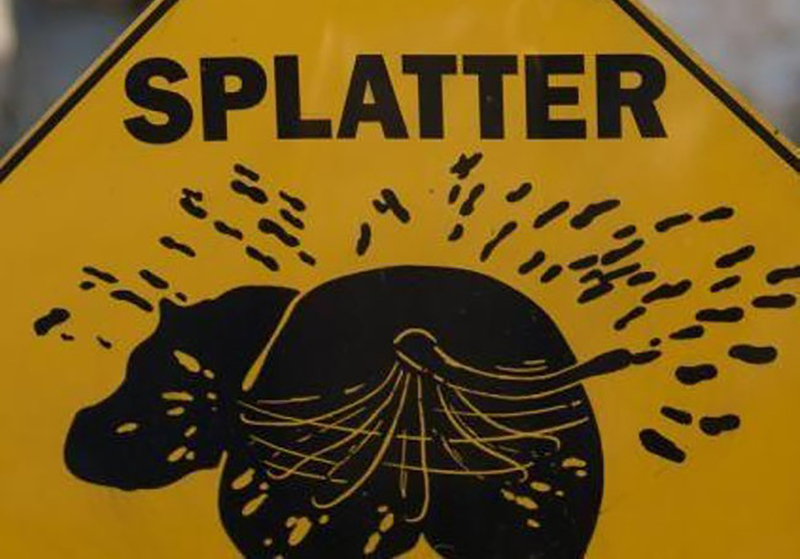 We’re willing to bet that people take one look at this sign and don’t need to be told twice not to get too close. Not only are those animals massive, but you probably don’t want their excrement all over you. 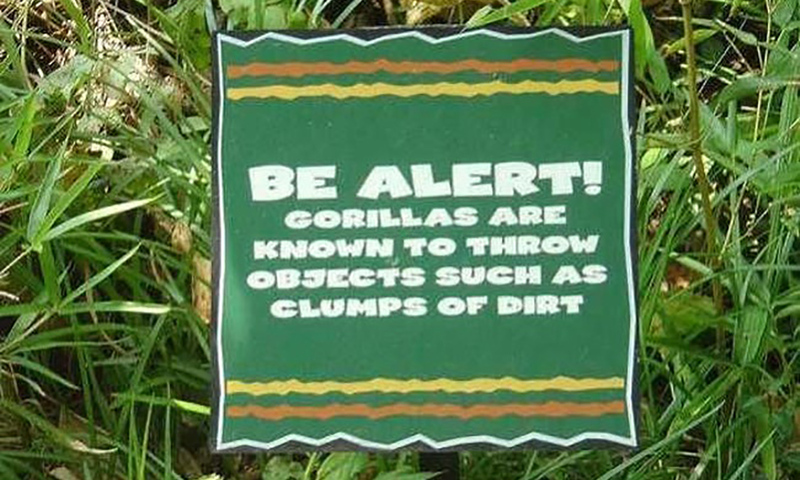 That’s a sure way to ruin a good day at the zoo. These are definitely the kind of animals that you want to admire from afar. Not only can they squash you like a bug, but they’ll poop on you while they’re at it. People go to the zoo to see exotic animals that they might not usually get a chance to encounter. However, when walking around and looking inside different cages and enclosures, it’s easy to forget that people are animals as well. This zoo wanted to remind its visitors that we aren’t any different from the animals that we pay to see. We’re all living, breathing creatures, so it’s important to treat all animals with respect. Of course, they still had to throw a joke in there. In a lion’s eyes, people are nothing more than a big juicy steak ready to be eaten. We’re especially easy prey for them because, without any weapons, our puny bodies wouldn’t stand a chance against their size, strength, and razor-sharp claws and teeth. Hopefully, this sign has prevented some people from ignoring the rules and daringly crossing the safety barriers. But then again, if you are foolish enough to do so, don’t complain to anyone if a lion attacks you. We can’t be entirely sure what’s going on here, but we’re going to assume that this is a warning sign that there is a slope that leads down to the crocodile enclosure. So, if you are in, or are with someone that’s in a wheelchair, it’s imperative to be particularly cautious. 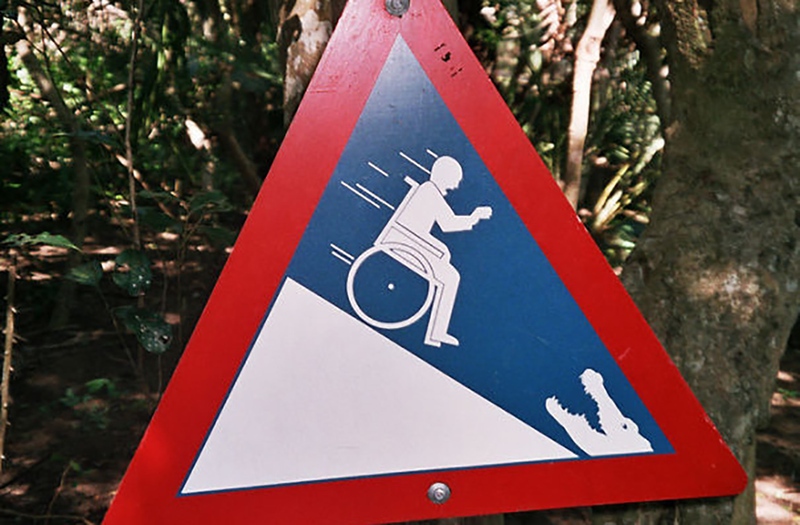 The last thing that anyone wants to see is someone in a wheelchair helplessly flying down a hill and into the mouth of a crocodile.